We were driving down the dusty roads of rural Somkhele, just after taking pictures of a flamboyant tree and an enthusiastic sangoma (traditional healer) who had let us into her sacred, traditional, ancestral hut made of reed straw, which is reserved for the sick and those in need of answers and divine intervention. Zwelethu had posed a question to me; I suspected he was still trying to find the answer himself. 'What is the one thing that we could photograph that represents health?' We played around with a few ideas, such as a jumping child, a clinic, a gym - we even mentioned a sports field. It was not until after I had exhausted all my ideas that I realized that there is more to a picture than a memory in time. With a picture, one can tell a story and stir emotions of love, joy, peace and happiness or inspire feelings of hate, sadness, bitterness and sorrow. I was born and grew up in this community that I now work for, but never before have I seen it as vividly as I have over the past two weeks. 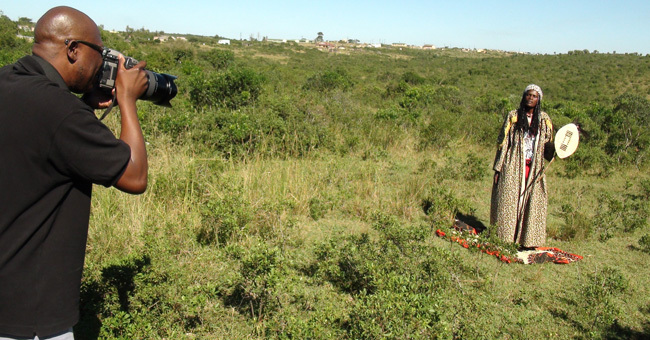 During this time, I have led the photographer Zwelethu Mthethwa in an extensive exploration of the region. He has taken photos of joy in poverty, life in sickness and hope in sorrow, and I have documented this journey with pen and camera. It has been an eye-opening experience and I have come to realise that in a community such as this one, the subject of health is a complex one. There is often a divide between Western and traditional medicine: two frequently conflicting views that share the same objective of health. I have come to realize that in this rural community, the subject of health is complex. It is a multilayered issue that cannot be understood without a good knowledge of the cultural, economic, political and geographic context. Perhaps that is why we will need to explore this topic through a series of images captured in a book or in a photographic exhibition about the residency.